Most kite flyers don’t like to cross lines. It seems inconsiderate, or at least a little embarrassing, unless you’re flying a fighter kite, in which case you have license to do it. In fact, crossing lines is the whole point of fighter competitions in North America, where cutting line is the equivalent of an assault weapon. Rather than worry others about whether or not we’re dangerous, we’ve developed a game where we touch lines instead of cutting them. Crossing lines can introduce you to some interesting people, so perhaps it’s time to introduce more kiting enthusiasts to crossing lines. Maybe you’ve seen line touch fighter kite events at festivals, or you’re interested in them, but you’ve never seen one. Maybe you just want to find out what the buzz is about fighter kites. If you want to compete, this will help you visualize what lies ahead of you, and avoid some common mistakes. If you want to watch a line touch competition, this will help you understand what you’re watching. Line touch competitions are the distilled essence of fighter flying in North America. The sport has evolved to flying fast kites on relatively short lines. Cutting line duels are fought at a distance as long as 1000 yards. Line touch duels are often fought at distances less than 50 yards, often getting within a few feet of the flyer’s hand. Flyers stand within a box or circle at a preset distance from each other, with their backs squared to the wind. The greater the distance between flyers, the more difficult the task of maneuvering to touch your opponent’s line. With more distance between flyers, points take longer to resolve. Distances vary, but normally flyers stand about 15-20 feet apart, in a circle approximately 8-10 feet in diameter or a box about 10’ x 10’. Stepping out of the circle is a foul that costs the flyer a point, or touch. The touch judge stands between the flyers, determines who wins, settles disputes, and calls whether the point will be flown as touch from above, also called “Top” or “Over” points, or below, also called “Bottom” or “Under” points. Once a point begins, it keeps going until it is resolved, by touching lines according to the judge’s call, or by one flyer grounding his or her kite. One of the interesting factors in short line battles is that occasionally a flyer will have the benefit of a wind shift while the point is being flown to momentarily gain advantage. This is part of the game, and adds to the excitement. Fighters can fly their kites within an area described by the wind, the field boundaries, and the length of line they have out. This is normally a hemisphere cut in half, from straight overhead, directly to the flyers right and left, and all area downwind. It is important to note that the possible places a flyer can put his fighter expands and contracts according to wind speed. 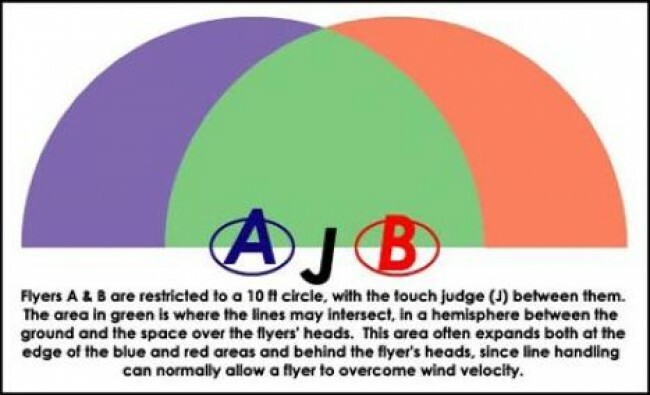 In a light wind, when a flyer can overcome the wind speed with a series of fast pulls on the line, the area containing the fight expands, because maneuvers can extend to behind the flyers, or upwind of where the flyers stand as they fight. In a high wind, the area shrinks, because kite control becomes more difficult, and maneuvers at the upwind edges of the half hemisphere we fly in are harder to maintain. Keeping this in mind can help you look for places where you can attack, or from which you can be attacked! 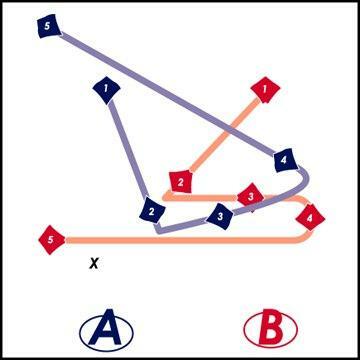 There is a paradox in short-line competitions; while you are attacking your opponent’s line, the easiest thing to see, and the thing that most flyers look for, is their opponent’s kite. The kite will help you to find where your opponent’s line is; but keep in mind that there are times in a fight when you need to ignore your opponent’s kite and focus on his line position. When you have made your brilliant maneuver and taken the advantage, no matter if it is a top or bottom point, your opponent will see it. Your opponent will immediately attempt an escape. If you have the advantage you should not focus on your opponent’s kite, since following the kite may take away your hard won advantage. Ignore the kite and focus instead on where your opponent’s line should be. Take the most direct path to touch the line. That might be close to your opponent’s hands! Valid line touches seldom occur near the kite bridles. Therefore, you should always remember to attack the LINE, not the KITE. A flyer putting a kite on the ground will account for about half of all line touch points, and this is not an exaggeration. A common result of hurried defensive maneuvers is a grounded kite. It is also a common result from a lapse in concentration. Even on Top points, grounded kites are common, particularly when one flyer is pressing an advantage. Be aware of the ground, and how to take advantage of it. All flyers have to respect it, and it takes nerve to stay close to the ground without crashing. A fighter kite on a long line will react more slowly than a fighter kite on a short line. On a shorter line, your kite will be able to travel more quickly through a longer arc of travel. Be aware of the length of line you have out, as well as the length of line your opponent has out. If there is a big difference, one of you will begin with an advantage. Part of the game is angles; the ability to act and react quickly will often decide a point. However, the shortest line does not always win. There are times when a shorter line can keep you from winning. Control of the kite requires quicker reactions on a shorter line; and in order to touch your opponent, you need to be able to reach him. Wind conditions, as well as the kind of point you’re flying, will determine how much line you need. Since the call of a Top or Bottom point is normally random, start from a line length you feel comfortable with, and take note of how much line your opponent has out. It will help you decide what to do. Before the touch judge calls the point out, he will do two important things. He will see that both flyers’ kites are in a neutral position, downwind and slightly to their side (right or left, depending on where they stand), and approximately halfway between the ground and straight overhead. This gives neither flyer a position advantage. Then, he will ask if each flyer is ready. At that point, if the flyers agree they are ready, and he sees that they are in a good starting position, he will call “Top” or “Bottom”, which announces what the flyers have to do, and is also the signal to fight. Don’t signal the judge that you’re ready if you’re not prepared to maneuver – take your time. Know where your opponent is. If you are at a disadvantage due to his or her position, you are NOT ready to fight! The beginning position is a fluid one; the wind and the flyers have a lot to say about how that position is set. You don’t have to start at a disadvantage. Be ready to move as soon as the point is called. That move will almost always be either up or down, depending on the call. The “Top” or “Over” point starts as a race to get position overhead. It ends with a diving attack by one flyer to touch the other’s line, or force the other flyer to ground. 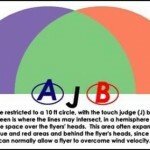 The top point requires active maneuvers; as a result, flyers normally pull in more line on top points than they release! This leads to the mistake of not having enough line out to reach your opponent. Lines get short quickly on top points. If you don’t have enough to start with, you are at a disadvantage. A good flyer will also maximize his or her angle of attack by stepping back to the back of the circle as the top point is called. If the opponent fails to match this maneuver, the flyer at the back of the circle has an advantage. Defensive maneuvers tend to involve dives, or moves toward the edge of the wind window away from your opponent. This can lead to a lot of grounding. Offensive moves tend to involve climbing to a superior position and diving on your opponent’s line, or hovering over your opponent’s line until he is forced to ground. This is a good time to mention the “suicide” rule. It is not enough to force your opponent to ground – you have to prove that you are in control of your kite. If your opponent grounds first, but you dive into the ground after the touch, you have committed “suicide” and the point is nullified. You have to be in control of your kite as you make the touch, or as your opponent grounds. This also prevents intentional grounding to score a touch. The “Bottom” or “Under” point starts as a race to get into position near the ground. It ends with a climbing attack into one flyer’s line, or one kite grounding. It becomes a test of skill and nerve to see who can control their kite nearer to the ground without crashing. Because these points tend to be controlled by patient flyers who hover and spin downwind, flyers normally let out more line on Bottom points than they pull in! 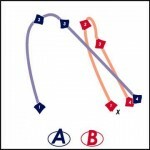 Since the kite will respond more slowly as it moves away, having less line out to start a bottom point is an advantage. A good flyer will move to the front of the circle for bottom points to get the best angle on their opponent. Offensive moves are low, horizontal passes and quick, darting moves to get underneath an opponent. Defensive moves are usually horizontal passes toward the edge of the window away from the attacker, and climbs to get the line out of the way quickly. Following a climbing kite on a bottom point is a mistake – it will often allow an escape. The best response is a horizontal pass that will make contact with your opponent’s line nearer to his or her hands. Another common mistake is trying to get too close to the ground. If you are not comfortable flying below belt level, dive to belt level and be prepared for a long, defensive horizontal pass away from your opponent. Not everyone can make a knee level horizontal pass – and if your opponent can do it, make your opponent earn the point by chasing you a long distance at very low altitude. Chances are good that the ground will come to your aid unless your opponent is very careful or very good. Either way, you’ve made a good play, and may be in position to turn the tables if your opponent rises. The important thing is not to go below your comfort altitude, and stay focused. A lot of bottom points are won high off the ground! I’ve been sabotaged in competitions from time to time by poorly tuned kites. Be sure your kite turns equally well in both directions, and spins at the speed you want. I’ve heard of flyers tuning kites to favor spinning in one direction in order to take an offensive advantage from one particular circle – but I don’t do it. You can’t be certain you’re going to get the circle you want, and the kite will be harder to control. Years ago, I won a match in a direct elimination draw because of kite tuning. While warming up, my kite was showing a bias to turn right. My first opponent saw that, and chose the left circle. I had corrected the tune on the kite, and was able to surprise him with offensive maneuvers that required me to spin well to the left. I won that match easily. Still, bad tuning will ruin your best plans. Know the conditions, choose the right kite, and be certain it is well tuned. Now I’ll describe two points, using examples where neither flyer grounds. I show the kite positions, as well as the flyers, and leave you to fill in the flying lines! While I may be taking liberties with perspective, the descriptions should help fill in any blanks. In the first example, at #1, a “Bottom” point is called, and flyers A and B are maneuvering to make a touch from below. Flyer A gets below flyer B (#2) and moves to get underneath him. Flyer B makes a horizontal move just ahead of flyer A. Flyer A finds his kite is rising above and behind his opponent’s kite, (#3) and flyer B reacts by making a turn to start a horizontal pass, while flyer A climbs out towards his side (#4), and the touch is made in front of flyer A at point X with the kites in position #5. In the second example, at #1, a “Top” point is called, and both flyers pull their kite overhead (#2). Flyer B needs more line, and allows his kite to drop a little while he gains line. Meanwhile, flyer A sees his advantage and reacts (#3), diving on flyer B and forcing him to dive away in response. The touch occurs at point X to the right of flyer B near the ground with the kites in position #4. Even flying points in the park with a friend is great fun, and the first time you make a nice touch, or a great escape, you’ll know the thrill of line touch fighter competition. The more flyers competing, the more fun it gets, and the thrills increase exponentially. Find out what all the grinning is about. Go to a kite festival and look for the little fighter kites darting around the sky. Watch the action, grab a fighter kite, and step into the circle. Cross kite lines with someone else on purpose. You’ll be glad you did! This entry was posted in 2003, Issue 31 (Jul/Aug), KL Archive, Single Line and tagged fighter, line touch, tutorial.